If you wish to find out more about loaning an animal and the associated contract, please contact me. The horse/pony must have access to either a field shelter or stable. Unfortunately we cannot re-home to grass keep only. If re-homed, the ponies or goats always remain the "property" of the sanctuary. Should the need arise, they are returned to the sanctuary for re-homing. Still unsure? Read on to find out about animals that have been successfully rehomed. Pippin and Jake, went to a lovely new home in nearby Littlehempston where they are thoroughly enjoying their new life! 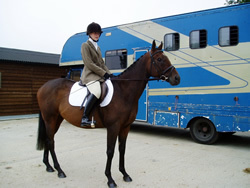 Mal - went to a home in Suffolk where he is advancing in dressage. Merry has been re-homed with a companion in the vicinity of Teign Estuary, Devon . All have gone to new homes which passed their inspections with glowing colours. It is good to find new homes, however it is heartbreaking to see them being towed away.